A judge has praised the bravery of a young couple who suffered devastating injuries when they were hit by a pick-up truck – and the passing doctor whose actions saved their lives. The judge made his comments after jailing the pick-up driver who not only drove off after hitting the couple, but turned round and drove past the scene again without stopping. Alistair Clutton, who was over the alcohol limit and had an eye injury at the time, pleaded guilty at Warwick Crown Court to two charges of causing serious injury by dangerous driving. 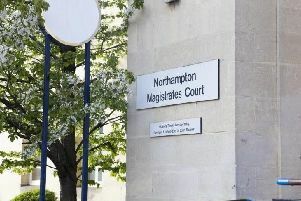 Clutton, 32, of Onley Park, on the Northamptonshire border, was jailed for two years and eight months and banned from driving for four years. Prosecutor Raj Punia said that Louis Bronstein and his girlfriend Kady Middleton were walking along the road from their home in Woolscott, near Rugby, at around 9pm on January 26. It was dark, but the couple were both wearing jackets with reflective pads on them when Clutton ploughed into them in his Isuzu Rodeo 4x4 pick-up truck and drove off. Miss Punia said that earlier in the day Clutton had suffered an injury to his right eye at work on a farm, and had been taken by his mother to University Hospital in Coventry. He had a 3mm corneal abrasion, and was given eye drops before his mother drove him back to her home. At shortly after 6pm Clutton drove to the Shoulder of Mutton pub in Grandborough where he had two-and-a-half pints before he left at around 9pm and drove off along Grandborough Road with his lights on full beam. “Louis Bronstein and Kady Middleton were in single file coming towards oncoming traffic and saw his vehicle, but were dazzled by the lights. “They recall very little after that, because he drove straight into them, throwing them onto the bonnet and into the windscreen before falling off into the ditch. The impact flung 25-year-old Mr Bronstein into the ditch, while Miss Middleton, a 21-year-old student, ended up on the verge at the edge of the ditch – but Clutton drove off without stopping. Fortunately Miss Middleton’s shoe and ear-muffs had landed in the road where they were seen by Dunchurch GP Dr Ian Czerniewski who was driving past with his car window down – and when he pulled up he heard a groan from the verge. He found the badly-injured Miss Middleton, so rushed back to his car to call for an ambulance, but could not get a signal. So he stood in the road to flag down another driver – but the first one to come along was Clutton who, having turned round when he reached the A45, was heading back to his home at the time in Willoughby and drove straight past him. A second car did stop, and from the headlights of that vehicle the doctor could see Mr Bronstein in the ditch. When the emergency services arrived the couple were rushed to hospital where they both had to undergo operations for their life-threatening injuries. Mr Bronstein had a broken rib, vertebrae and ribs, a crushed artery and knee and ligament damage, putting paid to his cycling, which he used to love, and he spent a month in hospital. Miss Middleton, who was in for three weeks, suffered lacerations to her liver and pancreas, an arterial bleed, a broken leg, ten rib fractures and a tear to the tube of her oesophagus. Meanwhile police officers at the scene found part of a vehicle light lens and, having established it was from a Rodeo, found there was one registered locally – to Clutton. He would not answer the door when they went to his home, so they had to force entry to arrest him. Clutton, who had a conviction for excess alcohol, failed a breath test, and claimed he had drunk two bottles of San Miguel since getting back, but there were no empty bottles in the house. He claimed he thought he had hit a deer and did not stop because he panicked, adding that when he returned to the scene to check what he had hit, he did not see the doctor in the road. Alexander Stein, defending, said Clutton, who had been told at the hospital that he was OK to drive, was on the autistic spectrum which could have affected his reasoning. But jailing Clutton, Judge Lockhart told him: “They were wearing high visibility jackets, and they were doing everything a responsible walker on the road should do. “Your paths were about to cross in the most devastating way. Any competent driver who was not affected by an eye condition and by drink would have seen them from some distance away. “You had every opportunity to see those people and every opportunity to slow down and to steer round them; but for some reason, you ran straight into them. “The impact was enormous. Both were catapulted onto the bonnet and both their skulls hit the windscreen right in front of you. If you had not seen them before, you saw them then and knew you had struck two human beings. “The injuries they sustained were life-threatening; but wickedly you drove away. It was not just a failing to stop, but a failing to stop and then coming back and failing to stop again. The judge added: “I have said much about Kady Middleton and Louis Bronstein. Their bravery has been enormous, in my view, and it shines out as a light in this dark case. “I commend them for their fortitude. The court can never attempt to pass a sentence which would begin to compensate them for the difficulties they face in their lives. “It is my view that someone else needs to be commended, and I publicly commend Dr Ian Czerniewski who stopped and did all he could to seek to save the lives of those two young people.